If you’re a fan of LA Confidential, then you’ll appreciate the nod to iconic symbols of Los Angeles – the Hollywood sign and the view from Mt. Hollywood of Griffith Observatory and LA. If you’re a fan of trivia about all things LA, then perhaps you’ve come across its original name: El Pueblo de Nuestra Señora la Reina de los Ángeles del Río de Porciúncula. Mercifully, we have the hipper and cooler sounding LA and LAX to help us avoid dusting off our rusty Spanish! Iconic sign of hopes and dreams for star wannabes. Griffith Observatory from the trail to Mt. Hollywood. Speaking of hip and cool, I spent Spring Break in LA and enjoyed a lovely dinner at Lucques in West Hollywood where Suzanne Goin creates amazing dishes. What does this have to do with potato hash? As alignment of the stars would have it, her book, Sunday Supper’s at Lucques, contains a recipe for Grilled Skirt Steak with Artichoke-Potato Hash and Black Olive Aioli, which I’ve made in the past. Knowing that LA appreciates potato hash meant that I could experience a hashcapade or two of my own, even if Lucques wasn’t offering it that night…sigh. 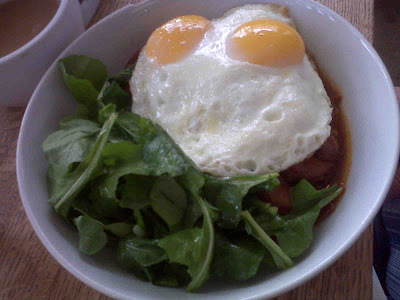 Niman Ranch Brisket Hash at Huckleberry Cafe in Santa Monica. The following morning after our sumptuous meal at Lucques, Lisa and I ventured out in the cool and rainy Santa Monica morning to find Huckleberry Cafe, a recommendation by my brother. I replayed Jon’s explanation in my head, “Their potato hash is more like a stew, but very tasty.” My brain, in dismay: “Huh? Is that legal to call it a potato hash then? Does it count as a hashcapade?” After my mental dissonance subsided, I ordered the Niman Ranch Brisket Hash and happily tucked into the savory broth, tender brisket and potatoes with perfectly fried eggs. An arugula salad shared the stage with this brisket hash production and almost stole the show! A deconstructed corned beef hash at the Fairmont Miramar’s Fig Restaurant. The corned beef hash arrived in a mini cast iron griddle and was actually a deconstructed hash. At the bottom was the ground corned beef with spices, two poached eggs in Hollandaise sauce, grilled asparagus and crisp shoestring potatoes with scallion garnish. The presentation was priceless! How was the hash itself? Very satisfying, but I missed the bigger bites of beef and potato that my rustic Niman Ranch hash had offered. I can say with extreme confidence Fig was far superior to my Hashcapade in a Can experiment! So, back in Portland and ready for a run to shed my Spring Break excess, I’m sure El Pueblo de Nuestra Señora has many other fabulous restaurants with tasty hashes…any reader favorites?